The Snooper DVR-2HD is an in car camera system. It records 130 degree angle of the road ahead and recording is made in 1280 x 720p HD. The recording device rotates 270 degrees to record both outside and inside your vehicle. The DVR2 will record GPS location, date, time and speed. The DVR-2HD is 105mm in length and 35mm in diameter making it very easy to mount either behind you rear view mirror on on the vehicles’ dashboard. It has an anti-vandal parking mode, 3 axis G-Sensor that responds to impact(s) and has a built-in microphone. Playback is done with the included software and you can view your route on Google Maps. The DVR 2 comes with a 16GB SD card. Snooper DVR-2HD has been discontinued. The latest dash cam from Snooper is the DVR-5HD. 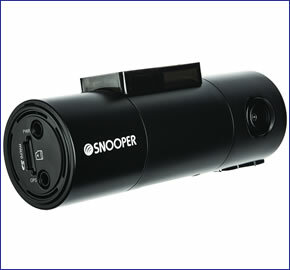 The Snooper DVR-2HD in car camera records in 1280 x 720p HD quality and uses the latest micro technology. You may want to install this camera for safety reasons or to use as evidence when proving driving offences and incidents. The DVR-2HD records using a 130 degree lens so you will be able to record a wide scope of the road ahead. The DVR-2HD also rotates 270 degrees so you can record incidents both inside and outside your vehicle. There are an increasing number of ‘crash for cash’ fraudulent claims being made. The best way to prove whose fault the accident was is to install and use an in car camera. The DVR-2HD will record date, time and speed of your vehicle and it works both day and night. Using GPS technology it will also record the GPS location of your vehicle. Using the video out you can then playback your journey on the included software and see your position on Google Maps. The Snooper DVR-2HD is 105mm in length and 35mm in diameter designed to be discreetly installed in your vehicle. This miniature high precision video camera can be mounted behind the rear view mirror using the quick release windscreen bracket or located on your dashboard using the cable clips. With the anti-vandal parking mode you can select for the in car camera to start recording when it detects motion or shock. This will then work to record incidents whilst your vehicle is left parked and unattended. The DVR-2 has a 3 axis G-Sensor that will detect impact from 3 separate directions and then start recording when impact is detected. There is also a built-in microphone that will record sound and conversations at any time. The DVR-2HD also includes a 16GB SD card that will record approximately 8.5 to 10 hours of video. Once the SD card is full the DVR-2HD will overwrite old videos first.